Kurozweki estate came into the Popiels possession with the marriage of Pawel Popiel to Emilia of Soltyks (7-21-1833). General view of the estate buildings. 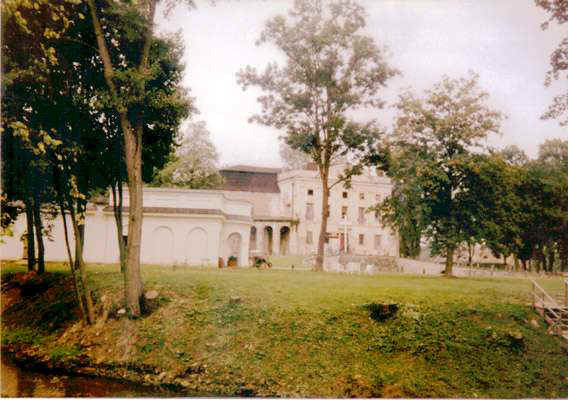 The palace is the far building and on the left, the pavillon, temporary living quarters of the owner, Mr. Marcin Popiel. Knight's castle built by family Kurozwecki in 2nd half of XIV century at the Czarna river, based on oval footprint with gate tower and enclosed with moat. Originally in gothic style, extended and additionally fortified in XV century and in XVII remodeled in Renaissance style by Lanckoronski family. In XVIII century the Soltyks remodeled it again in Baroque style. All these styles are visible in some parts of the buildings. Kurozweki, Stopnica county, province of Kielce. Popiel Pawel. The palace (former castle owned by the family of Rozyc Kurozwecki, rebuilt by the Soltyk family in present style in 18 century) has well preserved old interior (Luis XV) in two rooms, damask tapestry in green and red, in which the king Sanislaw August stayed in 1787 during his trip to Kaniow. Family archives. Library with books on various topics in various languages, rich in old prints. Soltyks' portraits. Por. : I.W., Kurozweki. ("Wies ilustrowana" z r. 1911, I).